With our order of relationship coffee on its way if a few days, we though we would just write up a few notes on what is Relationship coffee, focusing on the coffees we are sourcing from Columbia via our relationship with Virmax. 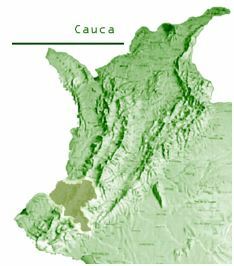 Located some 90 kilometres north-east of the colonial city of Popayán lies the municipality of Inza, in the area of Cauca. This area is located in the centre of the western and eastern slopes of the Cordillera Central of the Colombian Andes, right in between the Nevado de Purace and the Nevado del Huila, the latter an active Volcanoe. Elevated mountains – separated by canyons and rivers, make this land one of Colombia’s most beautiful and inaccessible. It is precisely this beautiful region that some two thousand coffee growers call home. These farmers cultivate coffee in the slopes of the mountains overlooking the canyon of the Paez river and the Nevado del Huila, at altitudes between 1,700 and 2,000 meters above sea level. Early in 2004, two hundred of those coffee growers founded a coffee grower association That they named “Asociacion de Caficultores del Oriente Caucano” (ASORCAFE). Until ASORCAFE was founded, most of the region’s coffee was sold to intermediaries who in turn sold it to other intermediaries or coffee exporters from the departments of Huila. therefore, almost all the coffee from Inza was sold as Huila coffee. Soon after ASORCAFE was created they setup their own warehouses and started purchasing their members production. By doing this they eliminated the middlemen and sold their coffee directly in Popayan obtaining better prices. Virmax started working with them soon after, educating them on how to improve the quality of their coffee, training 2 Cuppers from the association and setting up a cupping lab, as well as marketing their coffee as La piramide relationship coffee, a name that comes from the many pyramid-shaped mountains that can be found in the region. Thanks to this work, the coffee from Inza is slowly becoming well known in Colombia and the world and the members of ASORCAFE and their community are finally receiving the profits and recognition that they deserve. What this all means is that the farm/producer make more money, with no middle men except Virmax, between the grower and the roaster (us). Next Best coffee 100% Arabica?